Do not sell a pup without it being vaccinated and checked by the vet. There are different laws in different parts of the world related to selling puppies. Before you decide to sell your pup, do make it a point to check through the laws of the state that you want to sell it in. States like Virginia exercise the law, where it is necessary that the puppy is at least 7 weeks old before it is sold. In other states, the pup should be a minimum of eight weeks old. The reason behind formulating such laws is associated with the brain and body development of the puppy. Another important reason for not giving away the puppies before eight weeks is because they need this time for legitimate, gregarious development with their mother and other fellow mates. This is how puppies learn to behave. If this aspect of social development is not encouraged, puppies either become too demure, conceited, or sluggish. A pup has to be given mommy dog's milk for the first 8 weeks. But if the owner gives off the pup in this period, it will be compelled to feed on other stuff. This might trouble the puppy's stomach, leading to vomiting and diarrhea, thereby resulting in poor growth. Nevertheless, some organizations (or agencies) dealing with animal shelters or re-homing pets are excluded because they might be associated with puppies who are already borne away from their mothers. Therefore, finding a new home for these puppies, rather than keeping them in a shelter home would be an advantage to them. Before re-homing the pup, do not forget to vaccinate it. Also, the vaccination records have to be shown to the buyer. Put up fliers at feed stores and pet stores. Pin up fliers on the bulletin board of veterinarians. But are you wondering how to make a flyer effectively? You just have to include the photos of the mother dog along with her pups. Mention your phone number and email ID along with the breed name and characteristics. Advertise in a newspaper or magazine. In the advertisement, specifically mention the age, gender, vaccination, and breed information of the puppies. There are people out there who want to buy these puppies to eventually sell them off at higher prices. There can even be people who just want to abuse the poor little beings and chuck them off later. Would you want that to happen to your puppies? We are sure you will detest this fact. Do make it a point to interview the buyer and understand if he will provide a good home; also make a note of how the puppy reacts to the buyer. Place at least $100 as adoption fees for each puppy. This will fetch you only those buyers who are eager to spend for the welfare of the puppy. If the buyer is wealthy enough, then you can be assured that he will not sell off the puppies for the sake of money. Being a responsible breeder, make sure to find buyers who are willing to give the puppies suitable time and a lifelong commitment. Check if he has a fenced yard, so that the puppies can be safe. Choose a location that is preferably in the town center (it may be expensive, of course), or at least at a convenient distance from residential areas. Find out if his landlord has permitted him to keep pets. Ask if he can pay for the veterinary and grooming expenses. Don't be greedy while pricing your puppies. How would you feel if you know that your puppies had an opportunity to get into a good home, but the price you asked for wasn't affordable by them? Do some survey and research to understand the average price of the puppies in the market. Also, figure out in which quality can your puppies be classified. Show-quality puppies fetch more price than pet-quality ones. Do not forget to include any of the veterinary care expenses that have been provided to the puppies. How about holding a puppy festival? Here you can show people the mommy dog along with her puppies. Think about some interesting games one can play with the dogs. This will help you to indulge the crowd and get their attention. Putting up a kennel at dog parks is a brilliant method of selling puppies. 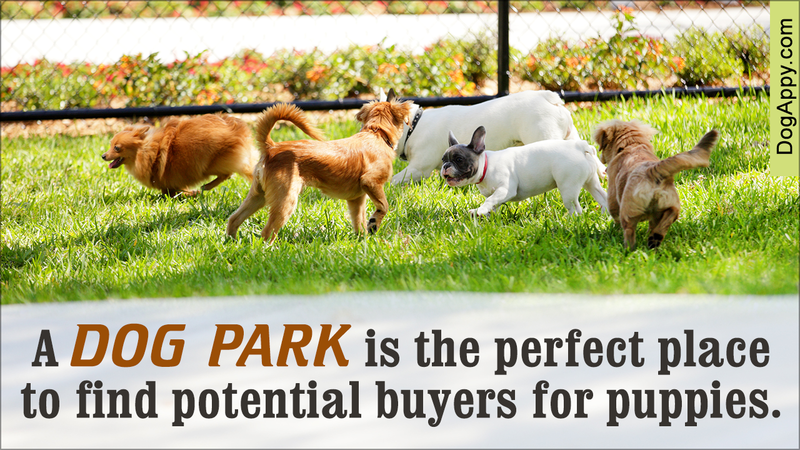 A dog park is the perfect place to find potential buyers. Here, you can talk and figure out who can provide the best homes for your puppies. Don't forget to provide the puppies in the kennel with fresh food and water. Post advertisements on Facebook, Craigslist, and Pawsites Online. You can post free ads on Craigslist. Do mention the dog's breed, age, vaccination information, and your phone number. Also, write that you will charge $100. This will keep away people who are willing to buy these pets for dog fighting and pet abuse. Once you receive calls from potential buyers, ask them if they have any experience in handling pets. Also, understand if they have proper knowledge about how to deal with dogs. Please request your buyer if you can visit his home before he adopts the pet. But if the buyer responds in the negative, then rule him out. If you do visit his house, take along a friend for safety reasons. Provide your buyer with the necessary documents. Ask the buyer to sign an agreement stating that the pet will be taken back if anything goes against the pet. Revisit the home after a week or so. Delete the ad on Craigslist once this procedure is completed. Provide the buyer with the written details about the date on which the pup was vaccinated along with the schedule for the next shots. Any health problems related to the mother dog or its pup have to be disclosed to the buyer before selling it. A breeder should give at least a week's health guarantee. This is the time when the buyer shows the pup to his vet. If the result shows that the pup is ill, then the breeder should willingly return the buyer's money and take the pet back.